I walleye fish with a variety of rods in St. Croix’s Eyecon Series, and the ECS63MXF Vertical Jig model is definitely my favorite for deep water jigging applications. It’s a short, fast blank that’s feather light and handles a wide assortment of jig weights. There are not many rods out there that can fish a 1/4-oz just as effectively as a 1/2-oz, but this one can. Depending on what’s needed on any given day, you can fish a perch-sized jig or a heavyweight monster using this one rod. It’s all about intelligent balance, great feel and the blank’s action overall. The Vertical Jig has a lot of forgiveness in the top ¼ of the blank and the rest is all muscle. Like you’d imagine, any jig rod that’s rated for half ounce baits is going to have some serious power. Operating from the bow of my boat, the idea is to keep total control over everything I’m doing with my rod, my line and my jig. I want to keep the whole works condensed as tightly to the graph’s sonar cone (I use a huge, old Lowrance X15mt on the bow, it’s a dinosaur but a fabulous unit) as possible. It’s not hard to see the bottom, fish or my lure. I’m able to feel things in ‘real time’ and stay directly over top of targets. A shorter rod helps a lot here. You’re basically ice fishing, up there. The Vertical Jig has an Extra Fast action that gives an effective hook-set, and moves jigs around well. Snap jigging has been hot late this summer. 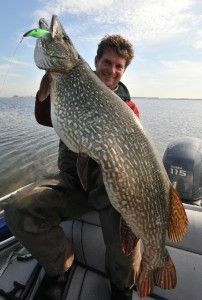 The lure rests on bottom very briefly before being sharply popped up three or four feet. It explodes up off the rocks, rockets back down and gives walleye a very unique trigger. 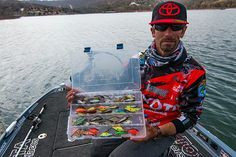 If you think ripping jigs is only a weed-line method for getting reaction bites on smaller, inland lakes, it isn’t. Try it in deep water on the big lakes, too. Fish love it. For dragging or hopping different styles of jigs or live bait, the blank is plenty sensitive. Some days, simply dragging and lifting a jig and minnow or jig and leech is the play. 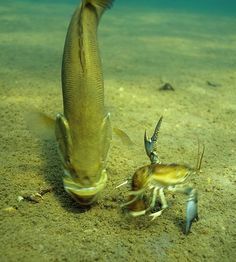 High-action tails, like grubs, can also be deadly when worked with very little action on the rod. What really drives the vertical game in 20, 25, 30 and even 40 feet of water is braided, zero-stretch lines. To maintain a vertical attitude with your line, to stay in touch with the bottom and to feel what’s going on in general, braid simply has no equal. Pound for pound it’s extremely thin, so it offers basically no water resistance. All of the feel and power it has really is secondary, in my mind. I use it because it lets me to stay right on top of my jig with the least possible amount of line out. More line out means a steeper line angle, more hang-ups and more downtime. Combined with the Eyecon Vertical Jig, you’re getting a very specialized combo that puts you right in touch with the walleye. That touch of softness in the rod tip is really nice for fishing braids, too. 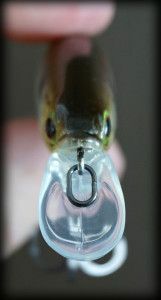 You get a little extra cushion for keeping fish hooked during big head shakes or hard runs. I use 20-lb test. It’s thinner than hair, but strong enough to bend open any hook, saving you lots of jigs over a season. These fish typically mill around rock piles and shoals during the day, and the bottom here is usually pretty rough. Typically, there’s lots of mixed-size rock, overhangs, turns and pockets. Some areas are challenging to fish and can eat up lots of jigs and lots of time, if you’re set-up wrong. Just like with any cover or structure, places with lots of ‘personality’ are what attract fish and their food in the first place. Being set-up to get in there and work it makes a big, big difference. The nastier the bottom, the better the fishing, usually. And the more vertical I’ll want to stay. The Vertical Jig has a tapered foregrip and a shorter, split-grip handle. It’s designed very specifically for fishing straight up and down and a treat to use all day, in terms of comfort. It really does remind me of one of my ice rods! 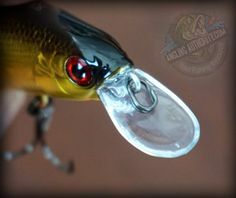 The Eyecon Series offers more than one jigging model and check these out, too. The ECS63MXF Vertical Jig is rated for jigs up to 1/2-oz and really does fit the deep water pattern beautifully. With autumn on her way, river current, deep structure and big walleye are all part of the mix. As the water cools off, jigging with big shiners, chubs or bucktails take over. Everybody be safe, let the big fish go, and enjoy the entire experience. For more information on St. Croix Rods, check out their website and Facebook page. 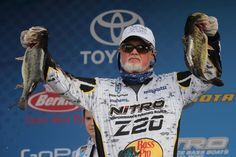 CL Fishin – Serious About Big!